No, Windows 10. Bad. Stop trying to get my attention. 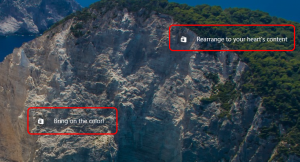 These icons visually pollute the lock screen image, and in many cases, Microsoft uses them to sway consumer behavior – something they’ve clearly grown fond of doing since people accepted free Windows 10 upgrades. Click the “Start” button, and search for “Settings,” then press Enter. Select the picture or picture(s) you’d like included, respectively. That’s it! Now, take a deep breath, and enjoy your newfound freedom from yet another source of advertising. * Beating a computer with a rolled up newspaper won’t actually solve anything. Best left to the imagination.